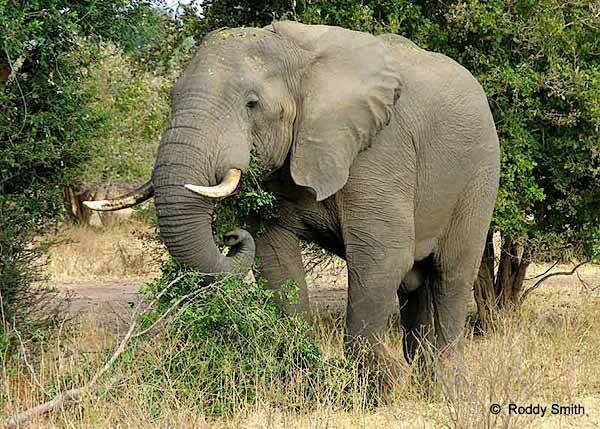 Caption: Elephant feeding on leaves and twigs, Lower Zambezi National Park, Zambia. Camera: Picture taken with a Canon PowerShot Pro 1 digital camera. Location: The Lower Zambezi National Park - 4,090 sq km in size - is situated on the northern bank of the Zambezi River, which flows along the park's boundary for about 120km. On the other side of the river is Zimbabwe and that country's Mana Pools National Park. Wildlife is prolific and varied, but the area is specially renowned for its large herds of elephant and buffalo. Lower Zambezi NP offers an exceptional safari experience for visitors, with options of canoeing, tiger fishing, game drives, and sundowner cruises available.